Start to ride a skateboard is never too late. And, best of all, first just try to stand on a skateboard, or to slowly move forward. Your body has to get used to the new position. Stand on the skate, you try to move the weight from one foot to the other, find the balance of the skateboard. Push off with one foot. If you are right handed, then you should begin also the right leg. Then the left foot will be ahead on the Board. If left – handed, then jump leg you have, respectively, the left and the right remains in the rack. Put the foot on the skate, just above the front wheels, pushes the other leg, and put it immediately on the Board as soon as it will go. Go slowly, learn to keep your balance. The next stage is the braking. To stay clear of standing back leg off the Board and hold it. It is the most affordable and versatile way stop. To slow down slightly, move the leg, standing back a bit ago and move it to the weight of the body. A more advanced way of braking - braking heel. The heel of the rear support legs tap the Board so that the backside of the skateboard set down, and in front a little up in the air. Whereby the support leg continues to manage skateboard. Learn how to turn on a skateboard is also pretty simple. Pull the front of the supporting leg slightly forward and turn your body or move the weight of the body in the direction of rotation. The fact is that when the skate is rolling straight, the axis of the rollers are arranged in parallel. But when you turn the hull or offset pressure on the inner surface the axis of front rollers set in the direction of rotation, and the axis back in the opposite direction. Skate turns. For the sharp turn stronger push back on the heel of the supporting leg, simultaneously shifting the body weight in the direction of rotation. The front wheels at this point, sits up, then in front of the standing leg you will be able to balance and control the angle of rotation. Don't try to make sharp turns. It is dangerous. Try to start to move the weight on your back supporting leg and stand only on her, turning the nose of the skateboard in different directions. Legs change places, turn around in place. Then go to the site for traffic. All probably remember the movie "Back to the future. There's the main character fits for riding the bottom of the cargo boxes with wheels. Some also accidentally born and the first skate. In General, it wasn't even skate, and surfboard that surfers have attached the rollers to make it easier to get to the ocean. It happened in the 50-ies of the last century in California. And in 1959 it was first released skate, or Board remotely similar to it. 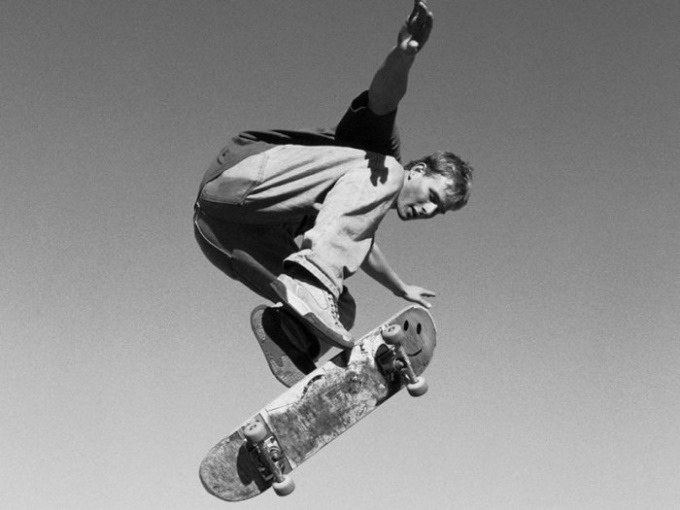 Since then, skateboarding has undergone many UPS and downs, and today it is impossible to imagine a modern "street" culture, and parkour.